Welcome to the Old Village Inn, where every visitor is a local and every local is our guest. 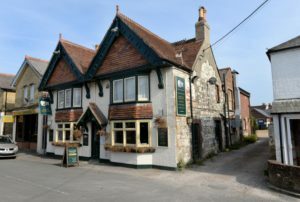 Nestled in the heart of Bembridge’s old high street, this quirky traditional styled building is reputed to have been serving pints since 1787. These days, Landlord Jay Chapman (a Fellow Associate of the BII) is continuing this fine tradition and sources real ales form across the country to ensure there are always four on the pump and an ever-changing selection. It’s not just excellent ales and wines that the Village offers. Home cooked food is served all day, every day. Our main pub menus are complemented with an extensive specials board using locally sourced produce. The Old Village Inn remains faithful to the community and sources produce locally wherever possible. The Farm Shop typically provides fruit and vegetables along with other ‘secret’ ingredients. Over the road is Woodfords the Butchers who are an institution in Bembridge. Our chefs work closely with them to source the best cuts of meat available throughout the year. The Old Village Inn shared a post. The Old Village Inn updated their cover photo. Had a lovely evening meal where the staff could not have been more welcoming, the service & food was excellent. There was a lovely friendly atmosphere with exceptional attention to detail & cleanliness. I came in and was immediately chatting to various locals and had a very warm welcome. Very dog friendly and a bowl of water was brought out without my asking for it !!! The food is very good but I regret not trying it sooner. Well worth a visit A real village pub. Just ignore the few bad reviews, they are obviously from someone with a grudge. Far better than the other pubs in the area.